I can’t even tell you how much I loved the work at Wiley Valentine. I’m seriously searching for the words. Please visit their portfolio and look at the wedding invitations with the beautiful and intricate scrolls and ornaments. Then go over to the baby and see the sweetly designed announcements featuring photographs and detailed illustrations. 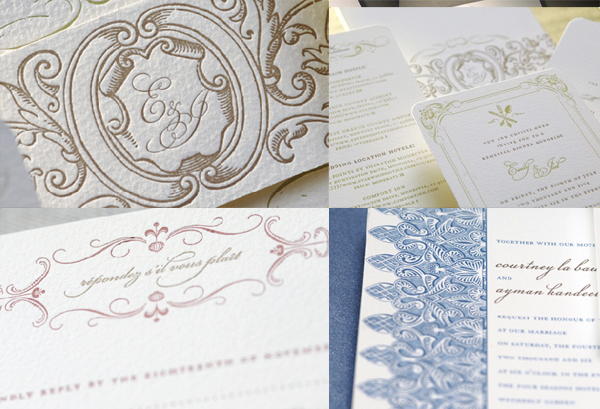 See the social stationery with the gorgeous monograms and the new collection with the new luxe wedding invitations and imprintables. Also notice throughout the beautiful envelopes that are printed to match with artwork bleeding over folds. Definitely a Stationery Show favorite. Various details from the collection and custom work of Wiley Valentine. This does not even show the full breadth because they carry so much more. See the website!